ISTANBUL (Reuters) - The fiancée of murdered Saudi journalist Jamal Khashoggi said on Friday she would welcome a change in Donald Trump's approach to the killing, and may visit the United States in March, having previously rejected an invitation from the president. Khashoggi, a royal insider who became a critic of Saudi Arabia's Crown Prince Mohammed bin Salman, was killed inside the Saudi consulate in Istanbul by a team of Saudi operatives on Oct. 2, provoking international revulsion. 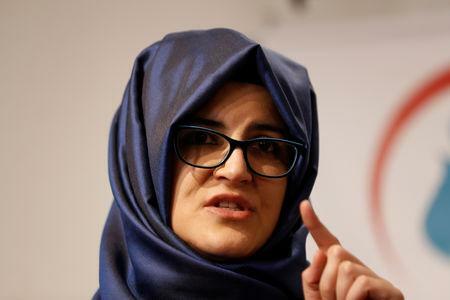 "I might visit America in March," Khashoggi's fiancée Hatice Cengiz told a news conference to mark the release of her book on Khashoggi. "I would welcome it if he (Trump) has a new approach on following this issue closely, or new actions to take." Earlier on Friday, an aide to President Tayyip Erdogan said Saudi officials' "complete lack of transparency" on the murder investigation is deeply concerning and detrimental to their credibility. "Over the past four months, the Saudi authorities have been less than forthcoming in their dealings with their Turkish counterparts and the international community," said Fahrettin Altun, Erdogan's communications director. 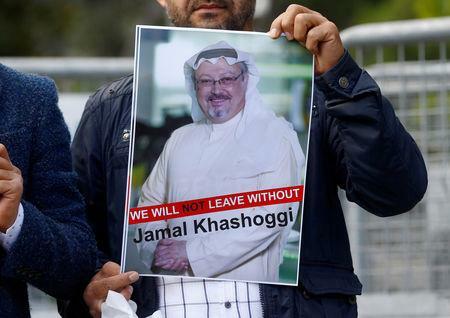 "Saudi authorities must extradite Mr. Khashoggi's killers to Turkey, where they committed a premeditated murder, as proof of their willingness to serve the cause of justice," he said in a written statement to Reuters. Republican and Democratic U.S. lawmakers renewed their push on Thursday to penalize Saudi Arabia for the murder ahead of Friday's deadline for Trump's administration to submit a report on whether the crown prince ordered the killing. "The Congress is renewed, the members are changed. I am hopeful. There is still hope. I believe the new Congress would follow this issue closer," Cengiz said. Democrats now control the U.S. House of Representatives. Erdogan has said Khashoggi's killing was ordered by the highest level of Saudi leadership. Riyadh has rejected accusations that the crown prince was involved. "I wish this report will accelerate the process so that more concrete things will be done on this situation," Cengiz said. "I believe the U.N. report would have an international impact. In an interview with Turkey's state broadcaster on Sunday, Erdogan said both the crown prince and Saudi's Adel al-Jubeir had lied about the case and pressure from Turkey had led to Jubeir being removed from his post as foreign minister in December.